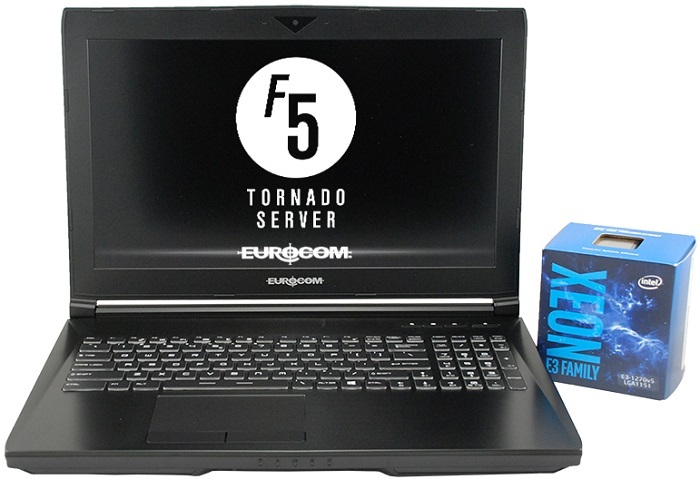 Eurocom has launched the Tornado F5 SE Mobile Server powered by Intel Xeon E3 1200 V5 series, up to 64 GB of DDR4 memory, up to 8 TB RAIDable storage and an integrated display, keyboard and UPS. The EUROCOM Tornado F5 SE is one of the few laptops with a C236 chipset, LGA 1151 CPU socket allowing this Mobile Server to support the following processors: Xeon E3-1240 v5, Xeon E3-1270 v5, Xeon E3-1280 v5. The EUROCOM Tornado F5 SE Mobile Server provides fast deployment right out of the box, combined with easy relocation and no need for a server room. The ability to hand carry the system makes the EUROCOM Tornado F5 SE an extremely easy system to relocate while providing server capabilities. “The Tornado F5 SE Mobile Server allows our customers to set up secure Cloud Computing capability on the go, with no risk of compromising intellectual property” Mark Bialic, Eurocom President. Unlike conventional servers the EUROCOM F5 SE Server Edition weighs just 2.9 kg/ 6.45 lbs and is equipped with an integrated keyboard, 15.6” LCD Display, touch pad and Uninterruptable Power Supply (Battery Pack). The EUROCOM Tornado F5 SE Mobile Server does not replace conventional server systems, it addresses emerging needs and opens up new opportunities. The All-in-One compact design, single computer solution allows for server capability anytime, anywhere. The EUROCOM Tornado F5 SE Mobile Server allows for either “on-the-go”, “rapid server deployment” or “Ad Hoc” (temporary network setup) when single server capability is required, multiple operating system compatibility is needed and running virtual machines is a must. Network Managers, software and/or database developers, training centers, military personnel, law enforcement, forensics, emergency relief and service organizations that require flexibility of deployment and powerful computing on-the-go, are the core beneficiaries of Eurocom Mobile Server technology. The EUROCOM Tornado F5 SE is driven by a complete line of optional 4 core and 8 thread Intel Xeon E3 V5 processors, based on the LGA 1151 processor socket and C236 server chipset. The Tornado F5 SE comes with 1GbE; Qualcomm/Atheros E2500 Ethernet port on-board. Equipped with a built in uninterruptible power supply (UPS) in the form of a 8cells; 14.4V 5225mAh/75.24Wh lithium-ion swappable battery pack, which offers upwards of 1.5 hours or backup power in case of electricity failure, which allows for safe and secure shutdown after power loss. An external 230 W or 330W AC Adapter / power supply reduces internal heat generated inside the system and it also creates a smaller, lighter chassis that requires less ambient cooling than traditional servers. Eurocom Mobile Servers supports server class operating systems such as Server 2012 R2 x64. With the plethora of server class components extra virtualization capability is a given, allowing higher performance, extremely stable virtualization on one platform. The Tornado F5 SE allows for network virtualization, multi tenancy and storage resource pooling. Go to www.eurocom.com to customize your very own Mobile Supercomputer.